BIGZONE Story The BIGZONE in the personalized service industry, established for over 5 years with a excellent reputation for personalized matches. The Marriage Bureau was started in 2008 in the City of Karachi in response to the Muslim community`s demand for a service to assist Karachi professionals and non-professionals find suitable matches for matrimony. As the population is scattered throughout Pakistan, the bureau thus became the medium which linked eligible candidates for the purpose of marriage. The response and support we received from Pakistan Muslim & Non Muslim community, and its leaders, for the great service this bureau provided the community, launched the prospective of a growing future for the bureau. 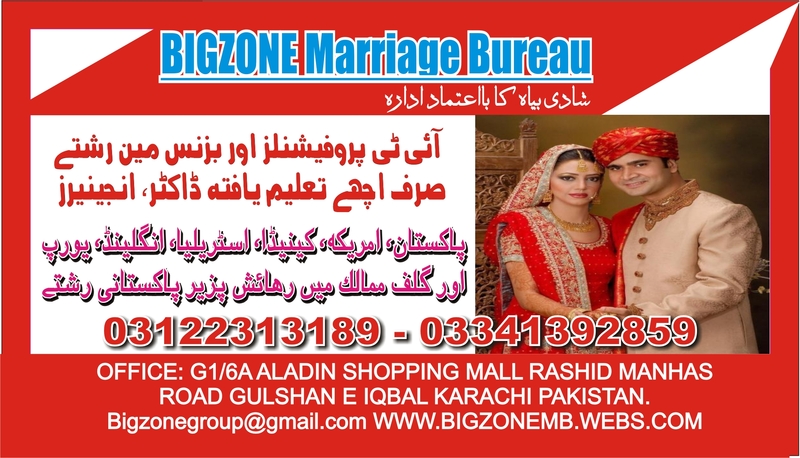 Office: G1/6A ALADIN SHOPPING MALL GULSHAN-E-IQBAL KARACHI PAKISTAN.